In 2010, France banned the wearing of the full-face veil in public pursuant to Law no. 2010-1192 of the 11th October 2010 (herein after as the Law). The Law strictly forbids anyone to conceal their faces in public places on pain of criminal sanctions (punishable by a fine of 150 euros maximum and an obligation to follow a citizenship course). Its application is not contingent to any religious practice and is limited in the subject matter: only the concealment of the face is prohibited irrespective of the reason. Still, the fact and the matter is, it primarily affects Muslim women wearing the full-face veil in public places and thereby of expressing their religious beliefs. In 2014, a French national lodged a complaint before the European Court of Human Rights (herein after as ECtHR) against France claiming that the ban was depriving her of the exercise of certain rights protected in the European Convention of Human Rights (herein after as the Convention). The case called SAS v. France, has attracted numerous reactions in the academic world and reignited a long debate in France on the expression of religious beliefs in public. This article purports to understand the grounds upon which the applicant’s claim was dismissed and the ban upheld. For this purpose, we will later ask the opinion of Professor Maleiha Malik, Professor in Law at King’s College London, Author, Barrister and specialist on discrimination law. In SAS v. France, the applicant alleged that there had been a violation of Article 3 (Prohibition of Torture and Inhuman Treatment), Article 8 (Right to a private and family life), Article 9 (Freedom of Thought, Conscience and Religion), Article 10 (Freedom of Expression) and Article 11 (Right to Protest and Freedom of Association) of the Convention, taken separately and together with Article 14 (Non-Discrimination) of the Convention. The Court found the parts of the complaint based on Articles 3, 10 and 11 ill-founded and therefore inadmissible. The debate was more intense with regards to alleged violations of Articles 8 (Right to a private and family life), 9 (Freedom of Thought, Conscience and Religion) and 14 (Non-Discrimination) of the Convention. The Court found the Law, as a measure which restricts a choice of clothing, constitutive of an interference with or a limitation of the exercise of the rights protected by Articles 8 and 9 of the Convention [para.110]. However, the limitation to the exercise of a freedom can only be justified by a legitimate aim as enumerated in the second paragraphs of Articles 8 and 9. The French Government had two lines of defense: First, the wearing of the full-face veil in public was banned on grounds of public safety. 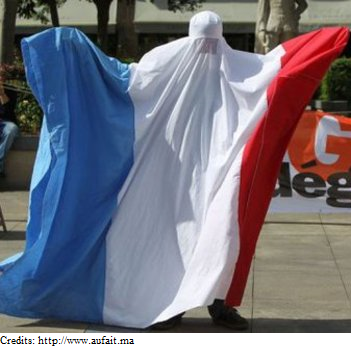 Second, the wearing of the full-face veil in public was banned on account of the principle of “vivre ensemble” (living together) and the respect for the minimum set of values of an open and democratic society. Regarding public safety, the Court found that the ban could only be deemed proportionate in the context of a general threat to public safety [para. 139]. Yet, the arguments of the French government fell very short to demonstrate such a situation in France. Finally, with respect to the second legitimate aim raised by France, the Court had to “link” it with the aim of protecting of the rights and freedoms of others enshrined in the second paragraphs of Articles 8, 9. On the latter, the Court stated that it falls within the powers of the State to secure the conditions whereby individuals can live together in their diversity and that a State may find it essential to give particular weight in this connection to the interaction between individuals and may consider this to be adversely affected by the fact that some conceal their faces in public places [para. 141]. Consequently, the ban was justified as far as it seeks to guarantee the conditions of “living together” [para. 142]. It must be noted here that the Court, compliant with its jurisprudence, afforded Frances a wide margin of appreciation in deciding upon what enters the realm of private or public interest (See ECHR – Evans v. the United Kingdom [GC]). As such, it does not determine at any point the legal or legitimate status of the wearing of the full-face veil in public with regards to the provisions of the Convention. Simply, it undertakes an analysis based on the particularities of the French society and its “compatibility” with the wearing of the full-face veil in public. And here lies the challenge! Indeed, the Court dismissed the gender equality argument insofar as the practice at hand was defended by women. In addition, the public safety aim was also rejected although, arguably, a ban was possible for public safety reasons and growing extremism, as it is the case in some Muslim states and regions in the world (Chad, Congo, Muslim region of Xinjiang in China, banned and later relaxed in Syria etc…). In SAS v. France, the crux of the case laid in the fact that women decided on their own, for religious and other personal reasons to wear the full-face veil in public. Righteously, one can feel in discomfort at the first sight of a fully veiled women but discomfort is no harm. As the Court admitted, the second legitimate aim raised by France (the principle of living together and the respect for the minimum set of values of an open and democratic society) is not listed in the articles of the Convention concerned. However, one can argue that the concept of “living together” is non-legal per se and quite subjective. On this note, Professor Maleiha Malik, explains in The Return of a Persecuting Society (Malik, 2014), that “a value-based reasoning can construct certain religion as “radical” and incompatible with French citizenship” thereby forcing a compulsory clash of cultures. Indeed, this principle of “living together” rests on the fact that France is based upon the constitutional principle of “Laïcité” : as provided by the 1905 law, the State is separated from the Churches and must remained independent of any religious practice. Furthermore, the insertion of immigrants in France is based, since colonial time, on the idea of their assimilation to the French culture. In other words, immigrants are required to integrate with the dominant culture in place of individualistic self-identity. Consequently in the application of assimilation of immigrants, there is a French culture versus another culture : a marriage of the two must automatically undermine one culture for the other to prevail. By stating that wearing the full-face veil in public is “incompatible” with the idea of living together in the French society [para. 141], France takes a huge risk in trying to define a stagnant French society to which people should either integrate or be in conflict with it. Professor Maleiha Malik notes in “Complex Equality : Muslim Women and the ‘Headscarf’”, that the law has a constitutive role in society and plays an important p in constructing behaviour : giving it sense and meaning, and influencing the self-interpretation of the participants. It is therefore very alarming to read that the rationale behind the ban, according to the Report of the French parliamentary commission, is that the full-face veil represented a denial of fraternity, constituting the negation of contact with others and a flagrant infringement of the French principle of living together – “vivre ensemble”[para. 17]. Alexandra Esmel (AE) : In SAS v. France, the French Government argued that the reciprocal exposure of faces was fundamental in French society to which the applicant responded that this argument failed to take into account the cultural practices of minorities which do not share this philosophy. Where do you draw the line, if you believe there is, between cultural relativism and multiculturalism. AE : The main argument of the French Government in S.A.S argument is the principle of “living together” in the French society. The question is therefore whether or not you can force somebody to reveal their faces in public. Is that/ should it be a requirement in society? What are your views on the fact that there could be a social contract which require its participants to respect written (i.e. the law) and unspoken rules (politeness; revealing one‘s face)? AE : The term “incompatible” was heavily cited in the decision and France insisted that the wearing of the full-face veil was “incompatible” with the French society and with the “objective of ensuring the social integration of groups of immigrant origin”. What are your thoughts on this? – Is the French Law of 11 October 2010 simply a reflection of France rejecting a societal change? Do you assimilate that notion of the “incompatible” to the “Bad Other” as explained in your introduction to Anti-Muslim prejudice in the West, past and present: an introduction? The ECtHR noted itself in SAS v. France that the role of the authorities is not to remove the cause of tension [between groups] by eliminating pluralism, but to ensure that the competing groups tolerate each other. France is demographically changing and is meant to change with time. Only, the interaction of these changes with internal policy will shape the present and future identity of France. Great article. Indeed is the full face veil a test on how serious we take our western values of liberty when it comes to the adaption of new cultural traditions.